Major developments in cancer screening, diagnosis and treatment have occurred for almost 150 years. See some of the major global milestones responsible for improving cancer outcomes. Free bowel cancer screening available to everyone aged 50-74.
WHO confirms links between diets high in red and preserved meats and bowel cancer. Commercial solariums banned due to evidence they cause skin cancers and targeted combination drug therapy halts disease and extends life in advanced melanoma patients. Cancer Institute NSW launches the Pretty Shady sun safety campaign. In a world-first, Australia introduces cigarette plain-packaging legislation. The Cancer Institute NSW is instrumental in the implementation. Cigarette sales are the lowest on record. Australia's first Gamma knife patient treated in NSW. Australia introduced school-based National HPV Vaccination Program to drastically reduce cervical cancer cases. Bondi lifesavers feature in the first state-based skin cancer prevention campaign, 'What are your chances'. National Bowel Cancer Screening Program begins providing free bowel cancer screening tests. Scientists announce they have mapped the human genome (DNA) which allows researchers to identify the genetic defects that power cancer. In the same year, Australia's first state-wide cancer control agency, the Cancer Institute NSW is established to lessen the impact of cancer in NSW. First patients treated with Tomotherapy treatment in USA. New targeted therapy transforms treatment for chronic myelogenous leukaemia (CML). Rituximab is developed, the first ever targeted cancer drug. The tumour suppressor gene BRCA1 is cloned. Specific inherited mutations in this gene greatly increase the risks of breast and ovarian cancer in women and the risks of several other cancers in both men and women. The following year, the similar BRCA2 gene is also cloned. Anti-nausea drugs alleviate major side effects of cancer treatment (Ondansetron). BreastScreen Australia first provides free population breast cancer screening. The National Cervical Screening Program is also introduced, halving cases and deaths from cervical cancer. 3D conformal radiation therapy allows doctors to shape the dose to the target tumours from multiple angles. Second-hand smoke is officially declared a carcinogen by the US Surgeon General. A large study, led by Cancer Research UK scientists, shows that tamoxifen prevents breast cancer from coming back after surgery. This work led to a major breakthrough in the way that early cancer is treated, saving thousands of lives. The 'Slip, Slop, Slap' skin cancer prevention campaign airs for the first time. Tobacco advertising on television and radio began being phased out in 1973. A total ban on tobacco and cigarette advertising commenced in 1976. PET, MRI and CT are developed - CT scanning enables doctors to assess tumours in more detail and target them through radiation or surgery without harming patients' healthy tissue. Radiation beam shaping using a multileaf collimators described by Takahashi, Japan. Chemotherapy found to cure Hodgkin Lymphoma regimen called MOPP. Roy Hertz and Min Chiu Li achieve the first complete cure of a human solid tumor by chemotherapy when they use the drug methotrexate to treat a patient with choriocarcinoma, a rare cancer of the reproductive tissue that mainly affects women. First patient to be treated with cobalt 60 radiation, Canada. Landmark studies in the UK and US conclude that cigarette smoking causes lung cancer (75% of Australian men were smokers at this time). Nitrogen Mustard is used to treat Hodgkin Lymphoma. The treatment was discovered from an agent found in deadly mustard gas used during WWI. Dr Jacobson performs the first experimental bone marrow transplants in animals, laying the groundwork for bone marrow transplantation in humans. Founder of L'Oreal cosmetics, Eugene Schueller, markets one of the first sunscreen products. Marie and Pierre Curie discover radium and in the following decades radiation therapy becomes widely used to treat many different cancers. 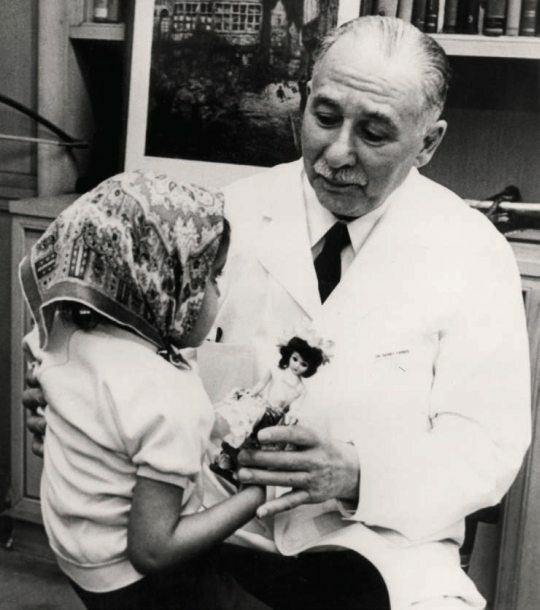 The first mastectomy for breast cancer is conducted by William Stewart Halstead.